American Dance Institute, Rockville, Md. Minneapolis-based choreographer Chris Schlichting’s “Stripe Tease” feels both intimate and expansive, drawing on his knack for specificity in inventive movement phrasing and his love of interior design and costuming, the piece evolves in organic and intriguing ways. As his layers build to full-blown climatic kineticism, the finely crafted hour-long work teases out lovely passages crisply performed accompanied live by the fabulous three-piece ensemble Alpha Consumer. 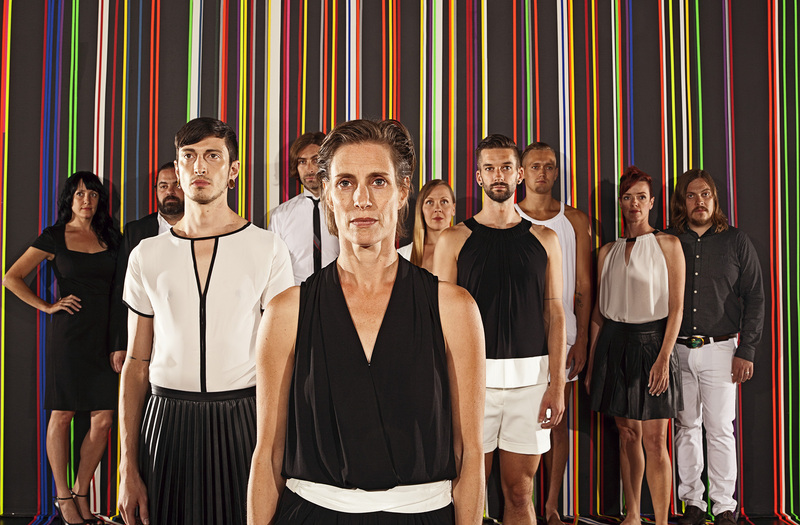 Schlichting and “Stripe Tease” made a metropolitan Washington, D.C. area premiere October 2 and 3 at American Dance Institute, one of three commissioning partners through the National Performance Network. Beginning in silence, two men draw a line in the air, then in tight unison relish a series of complex gestural phrases they deliver with uncommon grace and femininity – wilting hands, melting elbows, sloped, rolling shoulders. There’s an unspoken subversion of masculinity – or is it usurping of femininity – in these men languishing in seemingly womanly motifs, which remains a subtle theme throughout the piece. With a softness and uncommon delicacy, this indulgent beauty and oozing liquid grace multiplies as additional dancers enter, singly and then in pairs, a structure that becomes a motif throughout the evening. The six performers, clad in couture-level black shorts or slacks, tops with slashes, visible zippers, fine pleats and high necks (all designed by Schlichting), relish the opulent, choreographic phrasing that allows for undulations contrasting with saber-like slashes or occasional audible stomps. Guitarist Jeremy Ylvisaker’s accompanying music, played live with drummer JT Bates and bassist Jim Anton, provides a rock-inspired and yet easygoing pop inflected foreground on which the dancers parse out their exquisitely evolved phrases. What sings in the piece as it develops are the juxtapositions among the choreographed sections – swift, semaphoric gestures that look like a protolanguage not yet translated – and the building drama unveiled from visual designer Jennifer Davis with an assist from lighting designer Joe Levasseur. At first a study in black, soon that backdrop rises to reveal a sea of color-school stripes in multihued fluorescents and foils. Think late 1960s, early 1970s, bathroom wallpaper and you’ll get the idea. Levasseur’s lighting, too, has a throwback feel, with his sometimes moody, sometimes hot fluorescent choices that open up the performers’ space into the audience. Playing with duets, danced in close unison side by side, but never truly partnering – there are no lifts, holds or supports in the piece – Schlichting relishes his own expressions of formalism, unleashing his dancers like indie fashion models for a take-no-prisoners fashion house like Rick Owens’ – their tough, hard stares intimidating one moment, then their eye scans an invitation the next. At one point the dancers become bored cat-walking models, pacing the stage in a broad loping gait, then mounting the steps into the audience, to pause and pose. Off to the side in an exit alley, a duo performs small sidebar movements, hands and forearms swiveling and waving like little handkerchiefs whipping in the wind. As the Schlichting with Ylvisaker’s musical support builds a crescendo into the work, the stage design elements have their own fashionable reveal. Stage hands, smartly dressed in black with vivid belts, draw back curtains and later side panels in each wing to reveal two tigers painted in fluorescent stripes of neon tape glowing orange, green and pink. Have all the choreographic movement markings been a tease for the stripes – or vice versa? No matter. How easy it is to get drawn into Schlichting’s world, where a dancer finger tracking a line in space early on then eggs forward into a rich collection of intricate and ever-evolving hands, arms shoulders looping in circles, cupping hands, full-blown and half-way there. Meaning and story here are, of course, subverted for the pure beauty and delicacy captured by the six fine performers: Dolo McComb Dustin Maxwell, Laura Selle Virtucio, Max Wirsing, Pareena Lim and Tristan Koepke. The work is far more than a tease, it’s a tantalizing collection of treasures with rewards for the patient and caring viewer.